For nearly half a century the "Little Hook" has been an indispensable backstage worker in the railroad drama. Hiding behind warehouses,or pinched between team tracks,the "Little Hook" has done a big job. Clattering and whirring, swinging back and forth, it has unloaded countless tons of everthing from I-beams to brewery vats. The prototype was designed in 1915 by the Industrial Brownhoist Company of Bay City, Michigan and built for the Pere Marquette Railroad. Brownhoist blueprints describe it as a 10-ton electric pillar crane. 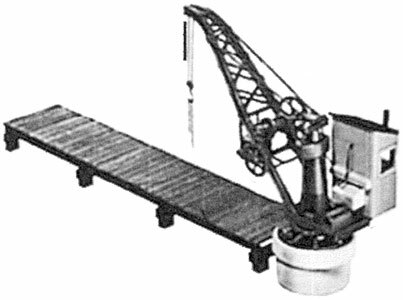 It is interesting to note that Brownhoist did not furnish the cab as standard equipment, and its design was left to the option of the individual railroads. As a result, nearly every crane operator has introduced his own modifications, and few "Little Hooks" will be found identical in appearance. Footprint: 1 1/4" X 6 1/2"
Copy this Brownhoist Little Hook to your MY ACCESSORIES roster.